1.0 What is Blended Learning? Blended learning [https://edtechbooks.org/-wPV] is the strategic combination of online and in-person instruction. According to the Christensen Institute, students in these classrooms learn “in part online, with some element of student control over time, place, path, and/or pace.” This type of teaching requires more than just classroom technology integration because it involves online learning as a part of the student experience. Because of this, you are required to have a broader set of skills than you would need for the typical classroom. Blended Learning is the strategic combination of online and in-person learning. A common K-12 definition adds that the blend needs to provide students with some control over time, place, path, and/or pace. What to Look For: Which of the 3Ms has the most direct impact on student learning? To teach using effective blended methods, you need to be able to combine online and in-person learning activities strategically. This can be difficult because both methods of teaching have different strengths and weaknesses. Our goal as teachers is to determine how to effectively combine online experiences with existing classroom-based activities to maximize student learning. As described in Video 1.2, online and in-person experiences should be integrated so that they inform each other and are not isolated from one another. What to Look For: How does blended learning differ from classroom technology integration [https://edtechbooks.org/-LiI]? Improved Student Learning. Blended teaching can enable instructional strategies not practical or possible in traditional settings. These strategies can lead to improved student engagement and learning outcomes. Increased Access and Flexibility.Blended teaching can provide increased flexibility and access to learning experiences by extending learning beyond the confines of the classroom. Increased Cost Efficiency. Blended teaching can also lead to some cost efficiencies in terms of time and money for both teacher and students. Though these benefits can improve practices, they cannot be gained by simply adding the online space to already existing in-person instruction. It is important to remember that blended learning is the strategic combinationof online and in-person instruction. You need to make sure that the online space talks to or informs what happens in the in-person space, and that the in-person space talks to or informs what is happening in the online space. Adding a learning application to your in-person classroom does not create quality blended teaching. Video 1.3 takes a closer look at elements important to quality blended teaching. Video 1.4 outlines six pedagogical [https://edtechbooks.org/-gFn]challenges (six Ps) that you, theteacher, can address in the classroom to help improve student learning: pacing, preparation, participation, personal interaction, personalization, and place. What to look for: What are some elements that characterize high quality blended learning? What to Look For: Which of these six challenges do you experience in your classroom? In addition to the 6 Ps described in the video, we have added a seventh P, Practice with Feedback. The following is a summary of The 7 P's [https://edtechbooks.org/-WqE]. Participation — During an in-person class discussion, only one person can share his or her ideas at a time. Teachers often try to remedy this difficulty by using small group discussions to increase participation, but even in small groups only one person can share his or her ideas at a time. Even when everyone gets the opportunity to share, one student may dominate the conversation resulting in groupthink or in one student’s ideas getting more attention than another’s. Online discussions can help to equalize the amount of student participation. Pacing — In the in-person space the class is expected to move as a whole when a unit or lesson has concluded.Within this aspect of blended teaching, students can move at their own pace, advancing when they have met specific benchmarks. Personalization — It is difficult to personalize learning to every student’s interests, skills, and goals. Online learning components can help teachers provide students with more agency in directing their own education. Place — The online space is much more flexible than the in-person space. Using online instruction allows students to learn wherever and whenever is most beneficial to them, whether that be at school before, during, or after class, or at home when they get back from their late-night practices, rehearsals, or part-time jobs. Personal Interaction — In the traditional classroom, instruction is often focused on the whole class. This practice helps monitor student behavior and manage the flow of classroom activities. However, in a blended environment, students are engaged in learning online, and you can spend more time conferencing and helping individual students. Preparation — Blending allows students to have access to course materials through the online space, even before or after class time, providing students with additional opportunities to learn. This can help address some of the difficulties teachers often face, such as having students come to class unprepared or leaving class without having access to the materials needed to finish their work. Practice with Feedback— You know that feedback is an important part of the learning process; however, it can be difficult to provide students with relevant, immediate feedback on all their work. Often, elements of online learning provide students with the opportunity to receive immediate feedback through responsive assessments and interactive activities. Blended teaching provides opportunities for students to develop knowledge and skills that will be essential to their future success. Because professions and society are changing so rapidly, it’s hard for us to know what skills students will need in four to five years, much less in fifteen to twenty-five years. However, The Partnership for 21st Century Learning (http://www.p21.org/) argues that at the time of graduation, all students should possess The Four Cs: Communication, Collaboration, Critical Thinking, and Creativity (see Figure 1.1). The Four Cs are not taught in addition to the course content. Rather, these skills are developed when students are learning the course content. To achieve this goal, you may need to change how you approach teaching and how your students approach learning. Blended classrooms can play an important role in making this change. Figure 1.2 The Four Cs: Communication, Collaboration, Critical Thinking, and Creativity. Blended teaching is an excellent way to provide access and flexibility to student learning. For example, consider students who miss class time because they are ill or are participating in an extra-curricular activity. The integration of online learning options and in-person class activities could allow these students the flexibility they need to balance health and academics or academics and other activities that are a priority to them. 1.1 What Does Blended Learning Look Like? It’s important to remember that there are almost an infinite number of ways to blend online and in-person teaching. That said, there are many different models of blended teaching that are commonly used by teachers. It is valuable to learn about the different models and to select the specific approach that fits well with your own teaching philosophy, school culture, and student needs. Figure 1.2 shows a spectrum of models. Each model has strengths and limitations and works well for different school [https://edtechbooks.org/-Skw]contexts and student needs. We will provide more depth for each model in Chapter 2. Figure 1.3 Spectrum of models of blended teaching for K-12 and higher education. 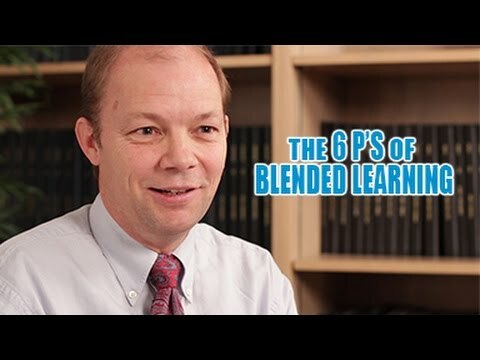 What to Look For: At this site you can see examples of seven different models of blended learning. You can also see links to schools across the United States that have adopted blended learning. As a teacher in a blended classroom, your role will likely be different from what you are used to in a traditional classroom. 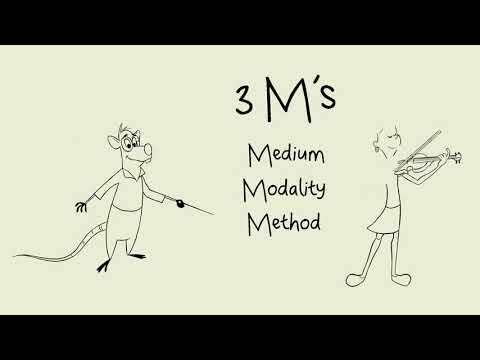 Consider the five core shifts described in Video 1.5 below. You may have to adopt some of these new roles as you begin to develop your blended teaching skills. What to Look For: What three things do they suggest that teachers should “let go of” or “do less of” as they transition to blended teaching roles? 1.2 What Competencies are Needed? Before learning about each of the core competencies of blended teaching, it is helpful for you to be aware of certain foundational dispositions and basic technology skills that will be helpful along your journey. Both of these areas are discussed in the following sections. Dispositions [https://edtechbooks.org/-BVV] are your core values, beliefs, and attitudes that influence the way you teach. 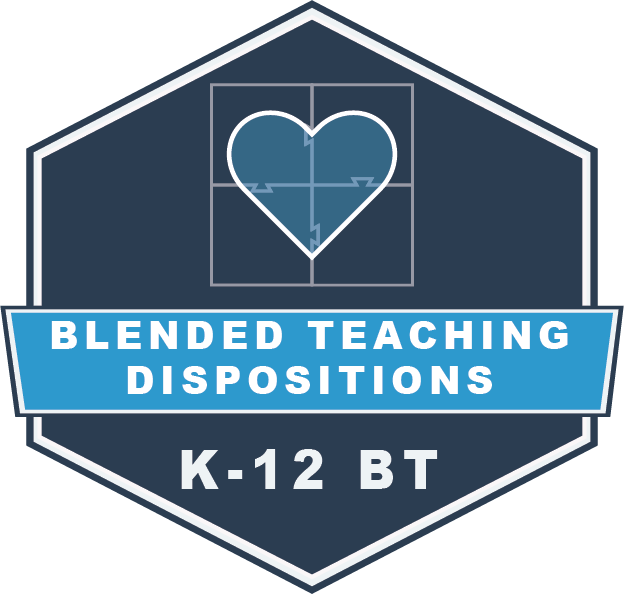 Important dispositions for effective blended teaching build upon what is already important for successful teaching in the traditional classroom. Table 1.1 contains a few areas that are particularly important for you to consider when it comes to blended teaching. Below each description in this table are values statements that align with teachers who share a passion for blended approaches. Successful blended environments often involve a shift from teacher-led to more student-centered instruction. This means students take on more responsibility for making decisions about the time, place, pace, and path of their learning. I believe most students have better learning outcomes when technology enables them to adjust the pace of their own learning. I believe individual student access to devices in the classroom should enable students to take greater ownership of their learning. Successful blended environments often involve a focus on mastery-based progression [https://edtechbooks.org/-ZFB] rather than time-based progression [https://edtechbooks.org/-sYG] (see Chapter 3). This means that blended classrooms will likely involve much less whole-class directed instruction. I believe that online technology is critical to implementing a mastery-based approach to learning in the classrooms. Successful blended environments almost always involve a reliance on data to help guide instructional decision-making. I believe that students should use data to guide their own learning progress. I believe that teachers who regularly use data to inform their teaching will be able to help their students more than those who don’t. Successful blended teaching will require taking risks, failing at times, learning to recover, and making improvements after failure. I believe it is important for teachers to explore new teaching strategies that blend in-person and online learning. Emphasis on Life Skills Successful blended teachers see value in using online technologies to enable the development of cross-curricular [https://edtechbooks.org/-EBk]life skills such as creativity, collaboration, critical thinking, and communication. I believe individual student access to online devices in classrooms enables development of important life skills (e.g., creativity, collaboration, critical thinking, communication). I believe that students need to gain experience collaborating online with each other on projects. 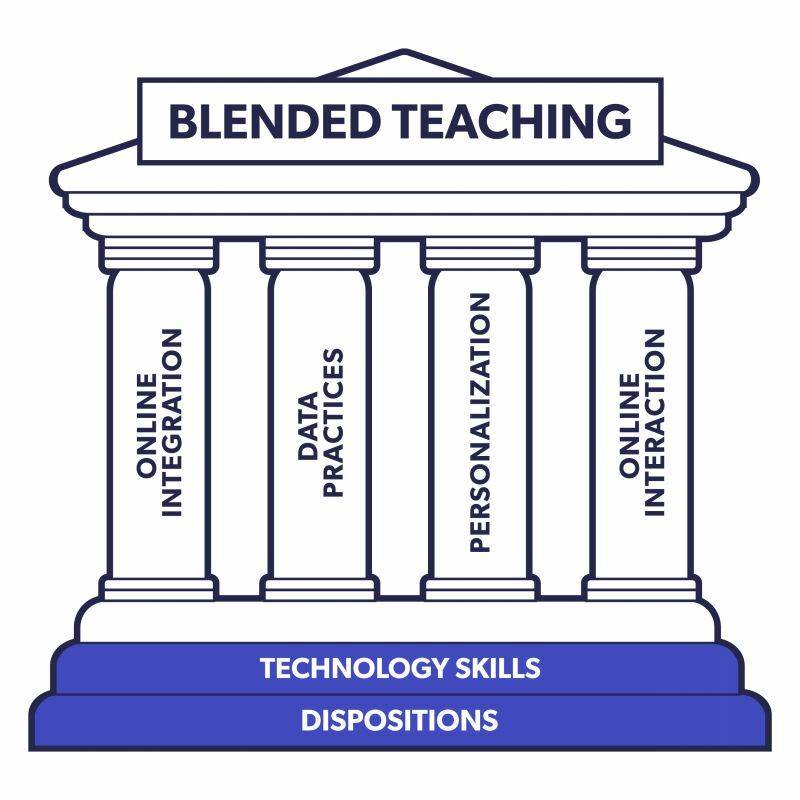 Successful blended teaching requires the careful integration of online and in-person instruction. Online learning activities must be valued as a core, essential part of the blend. I believe online technologies enable valuable activities allow students and teachers to do things that would be difficult or impossible to do otherwise in classrooms without online technologies. I believe that student learning is enriched when teachers and students interact in online discussions. Your dispositions can change over time. If you find yourself feeling skeptical about some aspects of blended learning presented in this book, we hope that seeing actual classrooms in action will help you to see the possibilities. The essential competencies needed for successful blended teaching are ultimately not technology skills. However, there is a requirement of basic technical literacy. As you develop a greater comfort level with online technology, using it in the classroom will become as native to you as using a whiteboard or book. While it would be impossible to outline all possible technical skills that teachers use, we have highlighted some of the most important elements you will need in Table 1.2. Technological Literacy How are your abilities in the following areas? Master new online technologies on your own. Successfully troubleshoot unfamiliar technological issues that you and students encounter. Find quality online content resources relevant to student learning needs (e.g., media resources, lesson plans, etc.). Model the legal use of instructional materials (e.g., copyright, fair use, creative commons). Ensure student online privacy (e.g., technology use agreements for sharing student data, protection of online data and identities). Model online safety for students (e.g., ensure password protection, protect against cyberbullying, detect scams, use content filters and virus software, etc.). Ensure academic honesty in an online learning environment (e.g., prevent cheating, check for plagiarism, etc.). Ensure access to online learning activities for all students (e.g., low socioeconomic status, English language learners, special education, gifted, etc.). Use the tools commonly found in a learning management system (e.g., gradebook, announcements, content pages, quizzes, discussion boards). Use content-specific educational software outside of the learning management system (e.g., math/literacy/science educational software, educational games). Use tools to create or edit content found online to meet your specific needs. Use a variety of tools for communication with students, parents and other stakeholders (email, text/SMS, video conferencing, etc.). Using student information systems (SIS) [https://edtechbooks.org/-IfM] to communicate activity and performance data to students, parents, and other stakeholders. This book may provide you with some help in developing many of these technology skills, but that is not its purpose. The purpose of this book is to help you use the skills you have already developed to begin blended teaching. If you need guidance in developing some of the technology skills needed for blended teaching, online tutorials are usually just a search engine click away. The first blended teaching skills this book will help you develop are for integrating online and in-person teaching, which will be addressed in the next chapter. Please provide us with feedback on the chapter and help improve future iterations of the book.